Aren't summer berries amazing right now!? They're fabulous in Illinois where I live! From the local grocer to the farmer's markets, strawberries, raspberries and blue berries are in season and in demand... at least at my home. 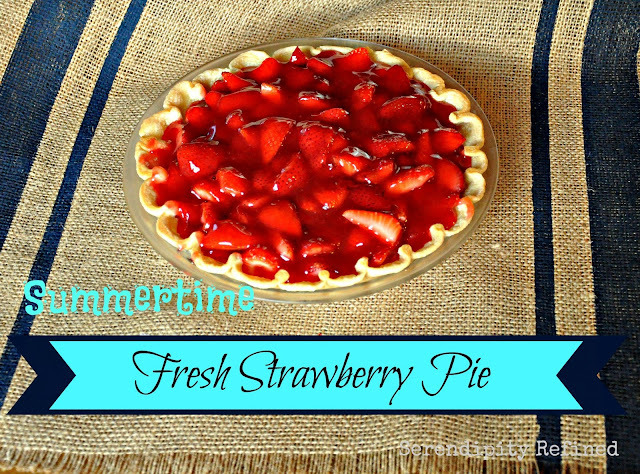 And what better way to enjoy them than in a fresh strawberry pie with home made glaze and a little whipped cream! 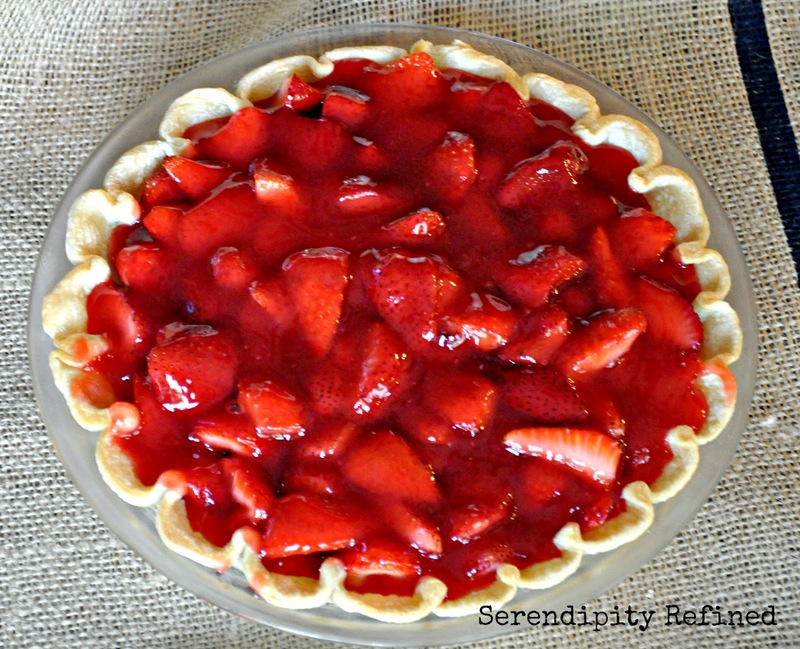 At around noon yesterday, my favorite neighbors invited us to join them for dinner and since, for some reason, I've picked up a pound of fresh strawberries every one of the five or six times that I've been to the market over the last few days; fresh strawberry pie seemed like the perfect dessert to make!! Since my son only used one pound when he made his home made strawberry ice cream, I was going to have a tough time explaining why there were still four more pounds in the refrigerator! First: there are no no step by step photos of how to make this pie. Just a couple of quick shots that I took as I arranged the berries in the shell and had a moment while waiting for the glaze to thicken. 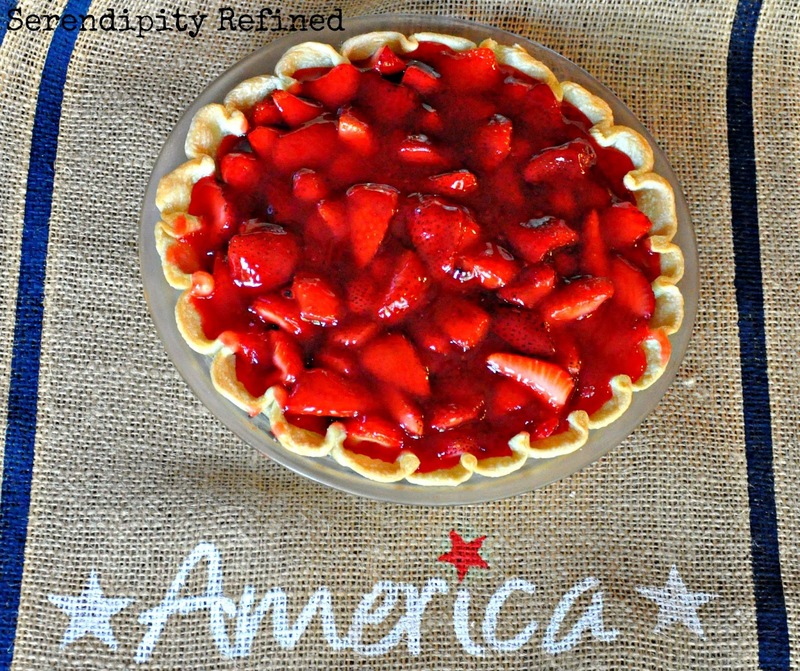 Second, there is no photo of a piece of pie with a dollop of whipped cream and a small American flag party pick artfully placed on top so you're just going to have to imagine that. Preheat oven to 350 degrees. Line the bottom of your pie shell with parchment paper or foil. Fill the crust with pie weights or dry beans and pre-bake the crust until golden brown (approximately 15 to 20 minutes). Remove crust from oven, remove pie weights and parchment paper and place crust on a wire rack. Cool pie crust completely. 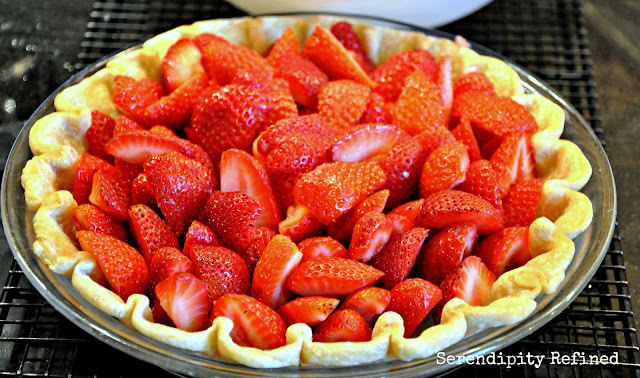 While the crust is cooling, prepare the strawberry filling. 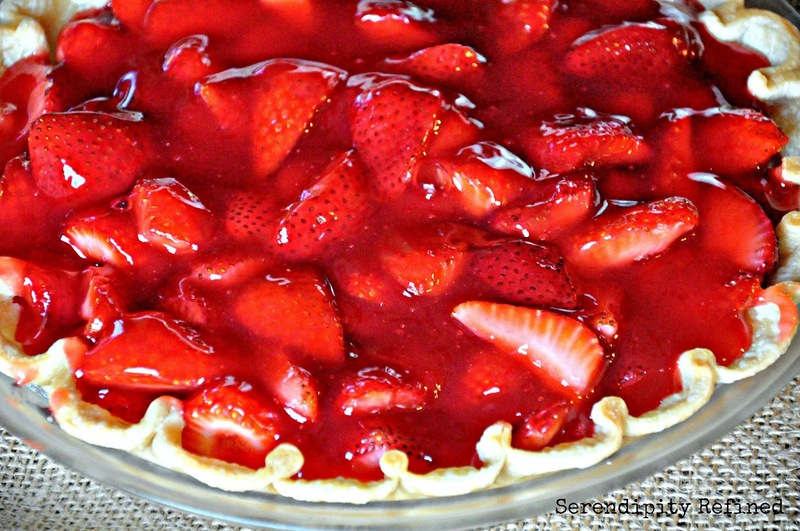 Combine sugar, cornstarch, gelatin, lemon juice, strawberry extract and water in a medium sauce pan. Bring the mixture to a boil. 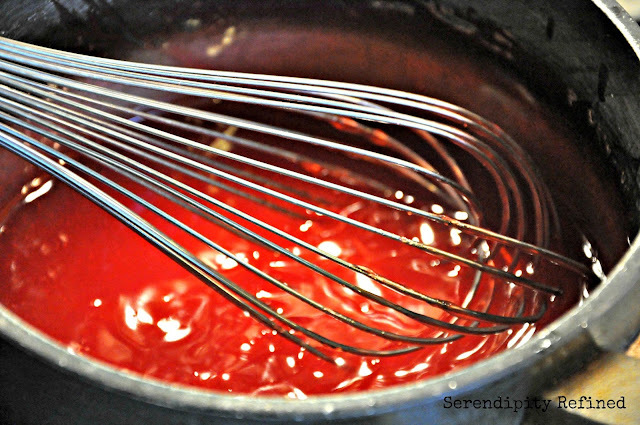 Reduce heat to medium and cook until the mixture thickens, whisking constantly. Remove from heat and cool the mixture to room temperature. 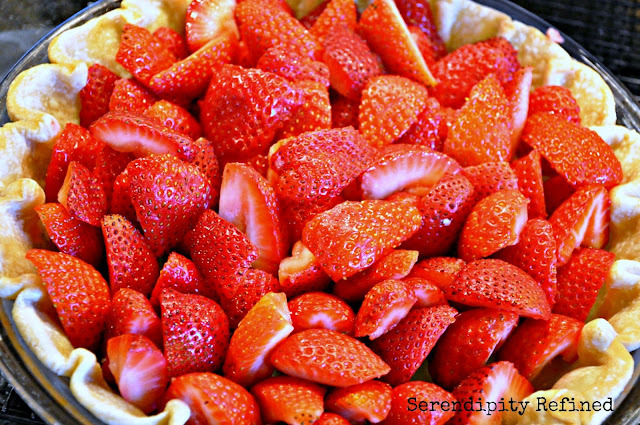 Arrange the prepared strawberries in the baked and cooled pie shell. Pour the glaze over the strawberries, coating them completely. Refrigerate until set (about 2 hours). In a chilled bowl, whip the cream until peaks form. Add super fine sugar and vanilla to taste. Store the pie in the refrigerator for up to 2 days. Serve with a dollop of whipped cream (and a small American flag and a healthy dose of patriotism). Fresh summertime strawberry pie...it's almost as American as apple!